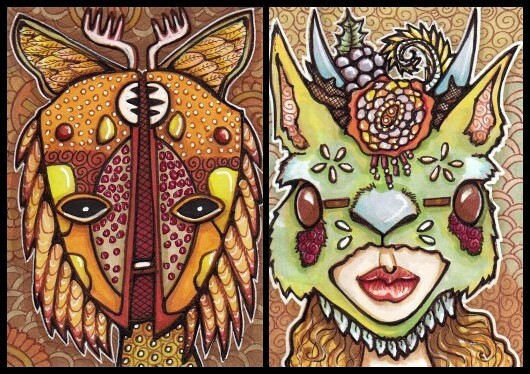 I am having a lot of fun with these shaman-type masks, made for a “Spirit Masks” swap at illustratedatcs.com. Also, I felt bad about skimping on the progress pics last time, so these have more than average. Hooray! I stepped away from ink for a while to do some painting (and hope to do more soon), but tiny pens are still my favorite. Here’s the whole group of the Spirit Masks so far (as previously posted). I suspect there will be more! Finally, I’ve been trying to decide on some kind of portfolio page, and one idea was to put my swap sets together, so I started a Portfolio of Swap Sets. So far I’ve got about a dozen swaps up. This entry was posted in Acrylics, ATCs and ACEOs, Copic Markers, Progression Photos on March 4, 2014 by The Beast Tender. Perhaps you could use a 3D printer and produce some amazing Mardi Gras masks. Great art. Cindy, cool masks. They look very New Orleans Matigraw-ish. The masks are great. I really love the details you can make with your pens. And I love pens myself!!! The page looks really good. It was an excellent idea!!! These images are *so* striking, and I love the wonderful detail in each illustration! Amazing, amazing! 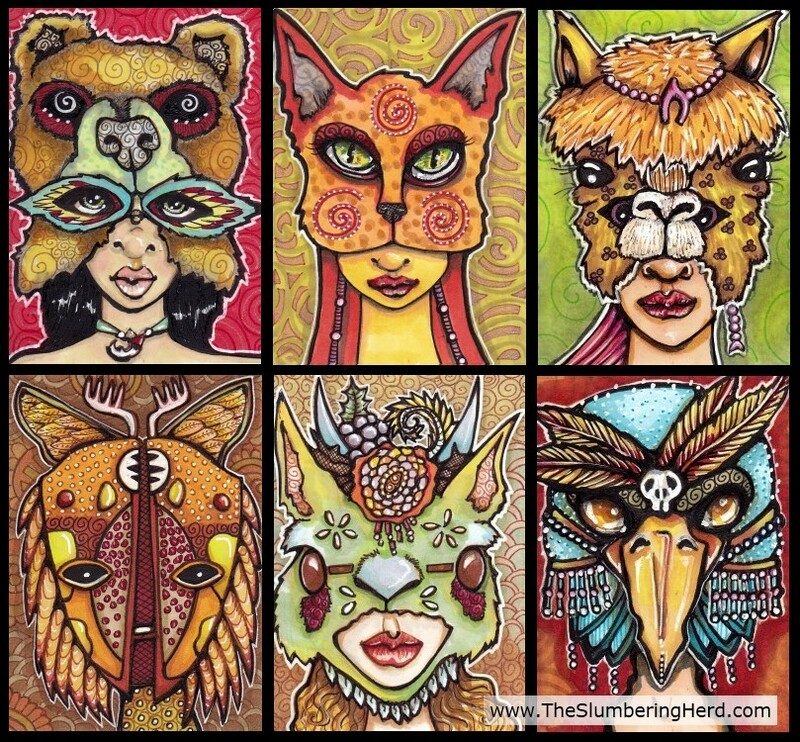 I wish these were real masks. I’d wear one! And congrats on finishing your 29 faces! What an awesome collection. I am in awe at the cast of characters that live in your head. You must have so much fun conjuring them up! The beetle one is very spooky and striking at the same time. Love the spiritmasks!!!!! Very graphic & dramatic… I came to peek at your faces (I am so sooooo late at visiting) and m blown away by your talent, truly wonderful work!! These are some of my favorite things you have ever done! Each one is incredibly realized. And this might seem like a weird thing to say, but I am in awe of these philtrums! The lips look completely luscious, too. Love being able to see the thoughtfulness of each addition with the progress pics. these are wonderful, each one! Love these masks, so original and nice colours. Wow, Cindy, these are stunning! The colours are so rich. I must tell you that I got into some marker pens because of you, although not copics. But I haven’t really mastered them. Wow! These really look spectacular when grouped together…..I just love your collections and themes. So hard to pick a favorite……I think the llama is mine. You should really turn them into something,……like cards, calendar….something! Holy hannah! These are AMAZING! Wow! You’ve been busy. They are all fantastic!